- multiple-choice questions on comprehension, identification, translation, etc. Student Edition Errata, this errata sheet refers to the 2012 printing of A Caesar Workbook student edition, click here to download. Part of the Bolchazy-Carducci Latin Literature Workbook Series edited by LeaAnn Osburn and Donald E. Sprague. A Caesar Workbook is ancillary to Mueller's Caesar, but may be used successfully with texts from other publishers. 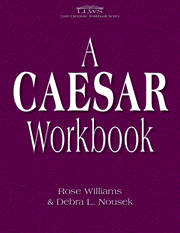 Written by Rose Williams and Debra Nousek, A Caesar Workbook is not a "stand alone" text, but a consumable activity book designed to provide extensive drill and practice material with a particular emphasis on grammar, syntax, and figures of speech. While the clear intention of this workbook is to prepare high school students for the Advanced Placement Latin exam, it is also suitable for use in intermediate college courses. Each chapter follows standard format with five difference types of exercises, each with a suggested time limit to encourage students to work efficiently and to accustom them to the conditions of the actual testing situation. Williams and Nousek begin with a passage accompanied by line-by-line preparatory, pre-reading questions to focus students on the structure of the passage. Multiple choice questions follow, which adhere closely to the format of the Advanced Placement Latin exam. These questions cover a range of topics that students need to be proficient with to do well on the test, including agreement, reference, translations, syntax, reading comprehension, and figures of speech. Brief passages for literal translation are then provided, followed by short analysis and in-depth essay questions, meant to focus students on key ideas, to support their arguments with quotations or citations from the Latin text, and to hone their critical thinking skills. Throughout the workbook, Williams and Nousek continually emphasize to students the absolute necessity of convincing the reader (or grader) that all their arguments are based upon a thorough understanding of the Latin text. To find out more about A Caesar Workbook, visit the aforementioned Bolchazy-Carducci website. You may also wish to visit the author websites. Rose Williams manages Rosa Latina, (http://www.roserwilliams.com), a popular site with an extensive collection of free teaching materials, book recommendations, and useful links. Debra L. Nousek's faculty page at the University of Western Ontario (http://www.wwo.ca/classicas/faculty_profiles/debra_nousek.html) includes a link to her presentation Taming Caesar-a fascinating look at nouns and pronouns in De Bello Gallico-from the June 2012 Annual Institute of the American Classical League.